★ In November 1858, the Town of Pepin Board of Health adopted a rule that “no carcass of any animal shall be left within forty rods of any building occupied as a dwelling” and that “every such carcass shall be burned by the owner or person having care thereof while living in such manner as not to be a source of disease or annoyance”. It was also ordered that “no privy, stable, shed, or receptacle of filth shall be created or remain on any running stream or bank of such stream, or sewer therewith connected, whereby the water of such stream shall be rendered unclean or filthy”. ★ Oakwood Cemetery was brand spanking new on June 4, 1858. Persons wishing to purchase a lot and receive a deed “at a very low price” should call on H. D. Barron, Joseph Manning, Milton Holden, or a Supervisor of the Town of Pepin. ★ The Wabasha Herald reported in April 1866 that the Town of Pepin “is now the scene of a most intense excitement”, owing to the mysterious disappearance and probably murder of Bradley Wheeler, one of its oldest citizens. On March 31st, James Carter reported the death by drowing of Mr. Wheeler, and said it occurred from his horse backing down a steep bluff on to the Chippewa, the ice breaking beneath the weight and engulfing the horse and cutter, and Mr. Bradley was drowned before Carter could get to his assistance, and the body carried under the ice. Suspicion of foul play was aroused and Carter and Mrs. Wheeler were arrested and charged with murder. There is no positive proof of their guilt, the body not having been found, but circumstances are against them. 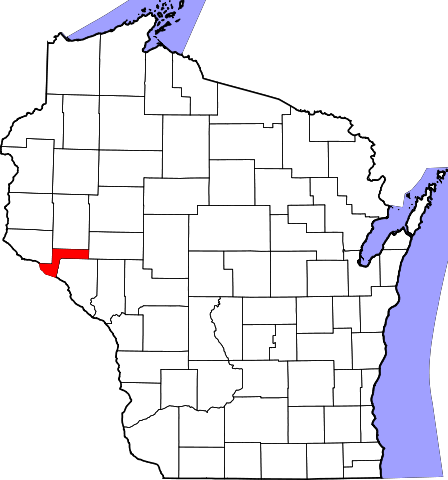 ★ H. J. Milliren vs. the Town of Pepin was a “celebrated road case” with many legal entanglements was tried before circuit court Judge E. B. Bundy in Eau Claire in January 1891. The town was defeated and had to build the road. ★ In September 1895, Mr. L. H. Stanton of Aloany, town of Pepin, brought a banana mush melon, raised by his son, John Stanton, that measured 15 inches and weighed 94 pounds. Also a peerless water melon, weighing 36 pounds, raised by himself. He has thus far presented the two largest melons to the Leaders’ big specimen contest. Pepin is located in Pepin County. is located in the Village of Pepin. Town of Pepin countryside -- all Laura's Big Woods gone . . .